Leigh Williams - I founded Laughing Moon Chocolates in 2002 to share my passion for creating beautiful, delicious chocolates in an inspiring, creative, customer driven atmosphere that promotes learning and personal growth. What is most important to me? Making people happy. Whether it's my staff or customers my main goal is always to provide a simple but memorable experience for every customer and a supportive, enthusiastic work enviroment. I have learned that it is often the simplest things that bring people the most joy and sharing my chocolates with the community has been amazing. 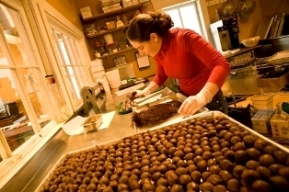 The business has grown over the years and now depends on an amazing team of talented and dedicated people, creating delicious chocolates and confections. They cook all the centers in a small copper kettle using the freshest local ingredients available. Generations-old recipes are utilized and improved upon to create buttercream, caramel, fudge, buttercrunch and truffles. Laughing Moon's shop and kitchen occupy a beautiful space at 78 South Main Street in the village of Stowe, Vermont. Our free-range eggs are often available at Laughing Moon Chocolates and hopefully next year we will start selling our own Maple Syrup! We have 120 taps on a gravity fed line system and so long as I can stop burning the pan, we should have beautiful syrup next spring. I earned a Master's degree in Public Administration in 2016 from the University of Vermont. Brittany Tatro - Operations Manager. Brittany has been working at Laughing Moon Chocolates since 2005, and is well acquainted with all of our local customers. She loves to share stories about her two dogs, Bindy and Stevie. Samantha Page - Assistant Operations Manager. Samantha has been at Laughing Moon since 2012. She enjoys hiking, seeing live music, and spending time with her three daughters. 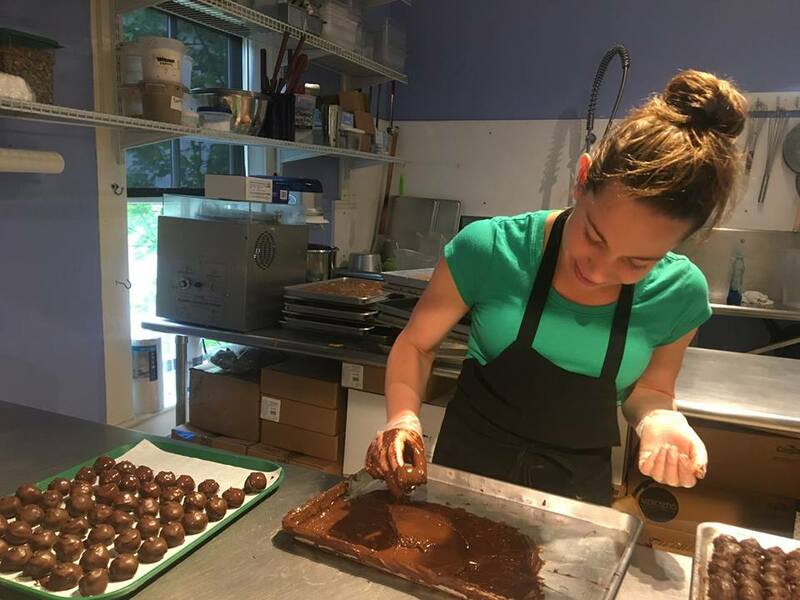 Sara Jacobsen started as a full-time chocolatier in the spring of 2017. Sara grew up in the Stowe area, and can often be found running along its beautiful paths and trails. 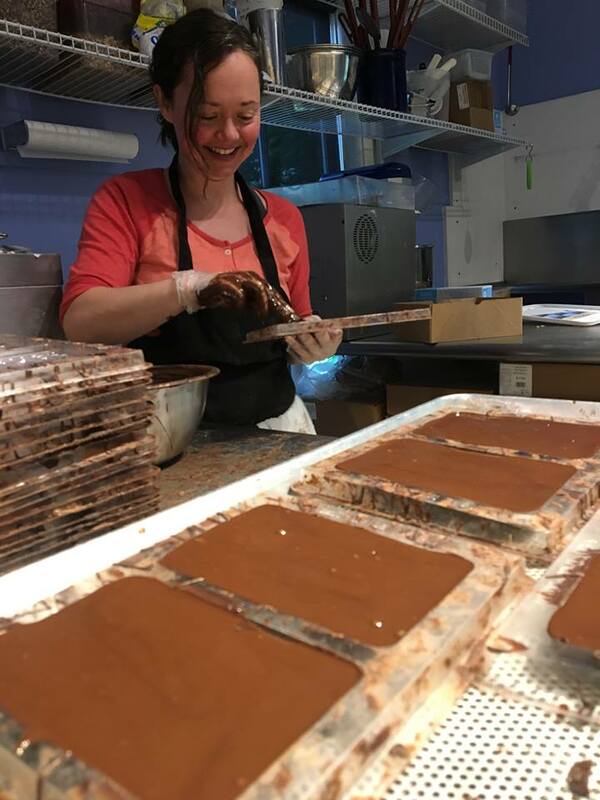 Anne Farley makes most of our signature chocolate bars on Sundays and Mondays while balancing her other job as a mom! Jennie Britton has been working at Laughing Moon since the beginning. She is lovingly described by her co-workers as "a machine" She can dip chocolates faster than anyone! 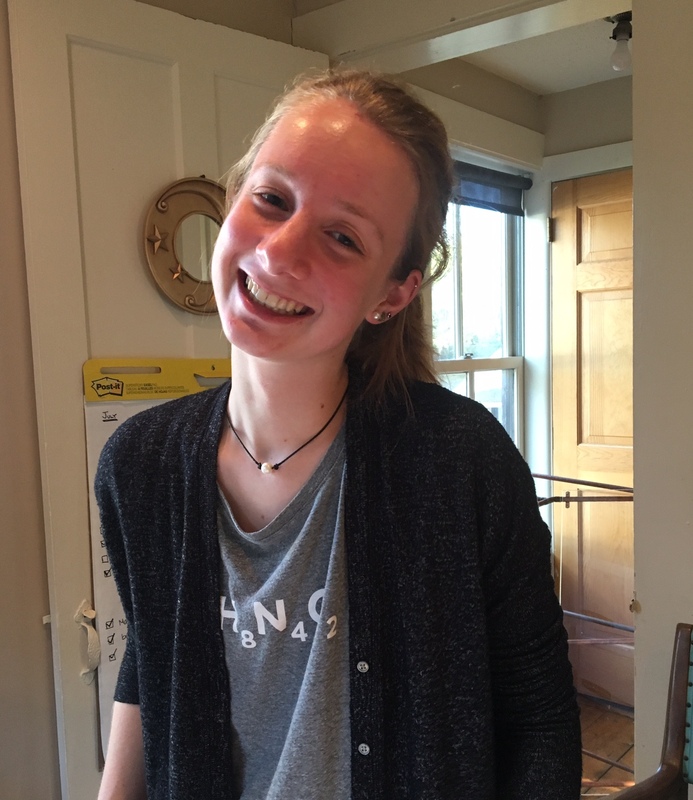 Ruby Stearns is a Junior at Stowe High School and joined the Laughing Moon Team in the summer of 2017... she is working on mastering her Latté skills!